Compatible Canon CLI-581XXL Black Ink Cartridge. High Capacity Cartridge 600 Pages. Compatible Canon CLI-581XXL Cyan Ink Cartridge. High Capacity Cartridge 296 Photos. Compatible Canon CLI-581XXL Magenta Ink Cartridge. High Capacity Cartridge 397 Photos. Compatible Canon CLI-581XXL Yellow Ink Cartridge. High Capacity Cartridge 296 Photos. Compatible Canon PGI-580PGBXXL Pigment Black Ink Cartridge. High Capacity Cartridge 795 Photos. Compatible Canon CLI-581XXL Photo Blue Ink Cartridge. High Capacity Cartridge 771 Photos. Canon Pixma TS8151 printer is a mini-sized, handy printer with 372 x 324 x 139 mm dimensions and 6.5 Kg weight. The printer is backed with 10.8 cm touch screen which allows easy navigation while printing directly from the printer. Moreover, the 6 Canon Pixma TS8151 ink cartridges provide colour accuracy in printouts. To reduce the maintenance cost the ink cartridges are available in XL and XXL sizes. The printer offers good paper handling capacity. For rear tray, the input tray capacity is either 20 photo paper or 100 plain paper and for the front cassette, the capacity is maximum 100 plain paper. Furthermore, the printer falls under above average category. It provides good printing resolution of 4800 x 1200 dpi with speed of 15 ipm for grayscale print and 10 ipm for colour print. The printer also provides optimum scanning resolution of 2400 x 4800 dpi. The printer offers various connectivity options so that one can easily print or scan the document from anywhere. The printer is versatile with various applications including PIXMA Cloud Link, Canon PRINT Inkjet/SELPHY app, Google Cloud Print, Apple AirPrint, Wireless Direct, and Mopria (Android). Pixma TS8151 printer is an inkjet printer with 6 separate Canon Pixma TS8151 ink cartridges. The printer embedded with LCD touchscreen for easy navigation, wireless connectivity options for trouble-free printing/scanning, dual feeder and auto-duplex features for flexible functioning. This compact size printer is perfect for small business or home offices. What should be done to avoid the paper from scratches while printing? Step 1: If you are printing with a wrong paper type setting, the printed surface may become scratchy. In borderless printing, the colour of print may not occur according to your expectations. 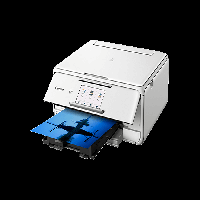 It depends on the paper type setting and the paper present in the Canon Pixma TS8151 printer. Step 2: The process for checking the paper and print quality settings differs according to the usage of the printer i. e. copying a paper, copying a photo. If the settings do not match, it is not possible to get the expected result. If you are printing a photograph or an illustration, a wrong paper type setting may reduce the quality of the printout. Step 3: You must select a print quality setting that suits the paper and make sure it gives you an appropriate result. If you notice blur on paper, increase the print quality setting and check the settings of Canon Pixma TS8151 ink cartridge then retry printing. For copying any description or photo, you need to adjust the settings using the operational panel. Step 4: You must check the quality of the paper before printing. Step 5: If you print plain paper with a high-intensity setting, the paper may absorb too much ink and it may become wavy. To avoid this problem try to operate printer with a low-intensity setting. Step 6: Avoid printing outside the recommended printing area of your paper, it can cause staining on your paper. Step 7: Clean the insides of the printer. Step 8: If the above checks are correct and still scratches appear then check the status of ink in the Canon Pixma TS8151 ink cartridge. Print the nozzle check pattern to check if the ink ejects properly from the ink cartridge. Replace the Canon Pixma TS8151 ink cartridge if the ink has run out. If the check pattern is not printed correctly, you need to perform a deep cleaning of the printer. Q. I am not getting satisfactory print results while printing through Canon Pixma TS8151 printer. What should I do? A. If the print results are not adequate, the paper used for printing could be an issue. We always recommend you to use good quality paper for printing. Also, using expired Canon Pixma TS8151 ink cartridges could result in faint prints. Replace the cartridges as soon as possible once you have the new ones available. Q. Can I order compatible cartridges in bulk from your site? What if I am not able to use them before their expiry date. Can you please suggest me what should I do in such situation? A. Yes, you can place the order for the compatible cartridges in bulk from our website. To prolong the life of ink cartridges, it is always suggested to store them in a cool and dry place with all the required environmental conditions. This will extend the life of ink and you will be able to use them before they dried up. Q. Will using the compatible Canon Pixma TS8151 ink cartridges spoil my printer? A. It is an unlikely event to occur that the printers print quality gets affected by using the compatible cartridges. The only case where a printer can get spoilt by a cartridge is that if it uses sub-standard parts, incompatible printer ink or is not tested and cleaned thoroughly before refilling. Q. What if my product gets damaged during transit? Do you recover the Canon Pixma TS8151 ink cartridges damaged during transit? A. Yes, we offer an immediate refund or replacement in case your order gets damaged during transit. In such a situation immediately contact our team and retain the original packing with your order. Q. What will happen if I am unavailable to take the order? A. We will attempt two deliveries at your doorstep from Monday to Friday between 9am-5pm. After two unsuccessful deliveries, the order will be returned to our warehouse and any further delivery attempt will be charged.